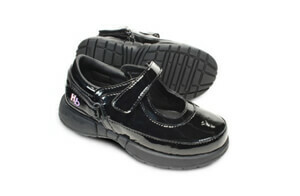 Hatchbacks are an exciting new range of children’s shoes specifically designed for children wearing AFO’s. OPS are the sole Australian distributors for these shoes. All Hatchbacks incorporate a patented hinge system called “Easy Fit” that’s as simple as 1,2,3. 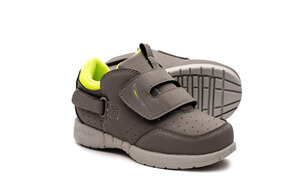 The easy fit system enables ease of entry and exit from the shoe by pivoting open at the hinge. 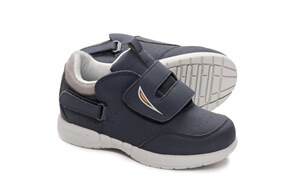 The shoe remains firmly closed by a Velcro fastener that is also very easy to use. What are the advantages of Hatchbacks? 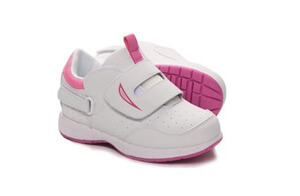 Children no longer have to walk in shoes that are too big for them. The pain of trying to force regular shoes on their feet can be avoided. The same sized shoe can be worn on both feet. Some children can put their shoes on independently. The following styles are available for purchase through OPS. OPS stock a range of sizes in each style. Please follow the instructions below to determine your child’s correct size. Measure the bottom of the AFO or brace (including toes if they extend beyond the brace.) All measurements should be in inches and should be exact. 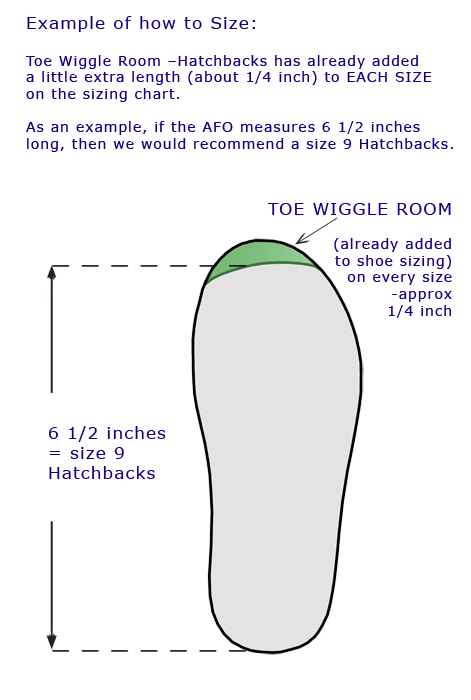 Measure the length of the longest part of the AFO – usually from the big toe area through to the middle of the heel. Measure the widest part of the bottom of the AFO – directly under the ball or behind the toes. Match the length in inches to the size chart below, be as specific as possible. Note: There is “toe wiggle room” already added to each shoe sizing ( see diagram) so do not size up. If you are not 100% satisfied with your Hatchbacks you may return your non-street worn Hatchbacks within 30 days for replacement, credit or a full refund. Please feel free to come in and look at the range of Hatchbacks we have at either our Leederville or Joondalup facilities. You may place an order in person, via email or phone.